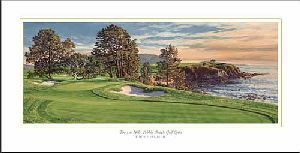 From humble beginnings, Pebble Beach Golf Links has grown to become one of the most famous golf courses in the world. Designed by two amateur golfers, Jack Neville and Douglas Grant, Pebble Beach Golf Links was initially maintained by sheep. While the Neville/Grant routing has remained virtually intact, the course benefited from enhancements in its first decade by many top architects including W. H. Fowler, Alister MacKenzie and H. Chandler Egan. In more recent years, both Jack Nicklaus and Arnold Palmer have contributed their expertise. Print released 2000.